Having the right bike for you and having it dialed in can make a lot of difference. It will make the ride performance better all around. It can also help prevent injuries associated with cycling and cycling position. This excellent excerpt from Triathlon Workout Planner by John Mora reprinted with permission from Human Kinetics. four figures at this point. 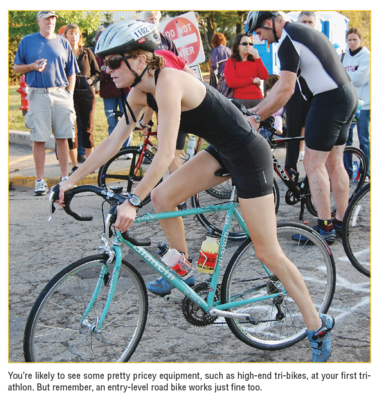 you have no alternative but to look into buying a triathlon bicycle. sections provide some guidance for you. chance that you’ll purchase the wrong bicycle. professionals who can tell you (through their experience) what not to do when you’re making that big purchase, and you have no reason to panic. How much will you spend on your first triathlon bike? 1. You might not know what you need. 2. You might think you know what you need, but you might be wrong. comfortably, than have to start all over a few months down the road. well into four figures with the addition of these or other accessories. cycling shorts, jerseys, gloves, and the other necessities afford you. off your bike and throwing it in the back seat or trunk. pedals at any time simply by extending your heel outward. Cycling shoes are designed for use with clipless pedals. in price, from $100 on the low end to more than $200. something that will last you for as long as possible. Ever ridden at 5:00am on a cold morning? Ever wonder why? Ever feel way out-classed at the starting line? At some point I think every cyclist and triathlete has done both. This except from Bike Racing 101 (by Kendra Wenzel and Rene Wenzel reprinted with permission) will help you walk through and prepare for that inevitable feeling. “You can make use of tactics successfully even in your first race if you use the building blocks of strategy we call the four Cs: course, competition, conditions, and confidence. Just as every bit of preparation you do should focus on the goals you set up for yourself in chapter 3, the races you choose and the way you conduct yourself in those races must further those goals. Applying the four Cs to each race you enter will go a long way in ensuring that you move closer to your goals with each race. In chapters 15 through 18, we apply the four Cs to each type of road racing, pointing out the nuances of each race and the preparation, skills, and practice you need to be successful. The course is one of the most important factors in how you perform in a race. Knowledge of the hills or gravel sections is strategic information. Even choosing to do the race (or not) based on its terrain is a strategic decision in your race season. Relate your strengths and weaknesses to areas of the course. Does the course have hills, flats, or windy sections that favor your strengths? In which areas might you be vulnerable and have difficulty following stronger riders? 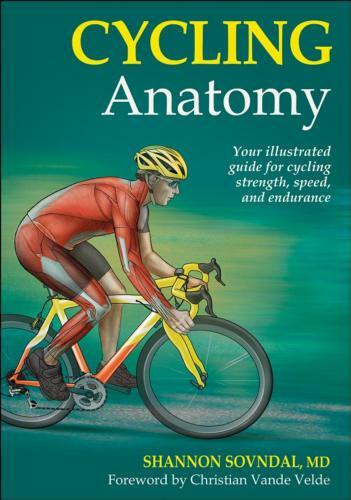 All riders should study course information ahead of the race, but many don’t bother. Knowing the course well can go a long way in improving tactics and morale. While the most effective way to scout a course is to ride it ahead of time, it won’t always be possible. In that case, find a map that details the roads of the course. The race Web site may even link to a map of the course. Perhaps the promoter has provided a map of the course in the race packet or has posted a magnified version on a bulletin board near the start. There may even be a course profile showing the race’s climbs and descents. Be familiar with the course so that you will recognize major turns coming up. The misfortune of going off course, even if it is not directly your fault, is still your responsibility according to race rules. Some riders even write course landmarks onto a piece of athletic tape and then tape it to their stem before the start. This is particularly effective in longer races. Once you have information about a race, process the facts. Knowing a course has 360 vertical feet (110 meters) of climbing per lap is a fact. But knowing that the 360 feet all occur in one 10 percent grade climb after a sharp right-hand turn, and that you need a 39 x 23 gear for it, is tactical knowledge. Ask riders who have done a particular course in the past, particularly those in your category who have done well there, to fill you in about the course’s challenges. If you don’t know someone who has completed the course, ask riders before the start of your race. Once you are at a race venue, become as familiar with the course as possible, especially near the start and finish. There’s no excuse for not knowing the first and last kilometers of a race; you should have arrived in plenty of time to check them out, even if you have to ride on the sidewalk while other races are in progress. Courses often have signs posted marking 5 kilometers, 1 kilometer, 500 meters, and 200 meters to go. Look for landmarks to signify these points in case you miss the signs in the heat of the finish. While the course provides the venue, the competitors make the race. As you race, take the time to discover the strongest competitors and teams weekend after weekend. Study their strengths and weaknesses. Just as important, consider how the other teams and individuals in your race may interpret your strengths and weaknesses. Being familiar with your competitors can remove some of the element of surprise in a race by helping you to anticipate their moves and to make moves of your own to isolate their weaknesses. If the same climber wins races weekend after weekend by climbing away on the main hill and riding solo to the finish, examine how this individual is allowed to get away with it race after race. Maybe one answer is to get to the hill before that rider, which would require an attempt to break away without that rider earlier in the race. In beginning racing, individuals rather than teams often affect the outcome. However, some individuals in the same club may be organized enough in the category 4 and 5 races for you to take advantage of that team’s strategy for your own benefit. More details on this are included in the upcoming chapters for each event. As you prepare for a race, consider the weather conditions and potential wind. When you arrive at a race venue, check the direction and strength of the wind and consider how it might affect various parts of the course. Knowing which way the wind blows will help you decide which side of the pack to be in at any point in the race. It will also help you plan ahead for the wind you will encounter after the next turn and allow you to set up ahead of time by moving up or to the protected side. Plan ahead by bringing extra clothing for cold days and extra water for hot days. Will you need long-fingered gloves and booties for an early-season race? Why take the chance—bring them along. Check for wind strength before deciding whether to use a disk wheel. Are the time savings of a deep dish or disk wheel worth the swerving the wind might cause? Check the pavement type on the race course and consider how it might affect tire traction if rain is coming. You may have to rein in your need for speed on descents and corners. If you have the option, bring sunglasses appropriate for the light conditions—dark for sunny days, clear for rainy or nighttime racing, or amber for cloudy, dark days. Losing to another competitor’s strength or wits is honorable. Losing to the weather is inexcusable. You don’t have to be a victim of wind and weather. Use the conditions to your advantage! Confidence is taking everything you know about yourself and tying it to the strategic fundamentals we’ve discussed. It is understanding your own strengths and weaknesses and gaining experience in group rides so that you know whether you are basically a climber, sprinter, time trialist, or all-around rider. Confidence is having the patience to wait for the right moment to show your strength, rather than wasting energy trying to be a different kind of rider. Confidence is having an awareness of your current fitness level and knowing whether you are on track with your training program and goals. It is also the ability to conduct yourself in accordance with your goals. For instance, if you are using races early in the season simply for training without worrying about the outcome, make constant attempts to get away for training purposes and don’t worry that you may potentially break away with other riders who can possibly outsprint you at the end. You might make a gamble, such as a long solo breakaway, just for the training—an action you might not try in a more important race if you are a good sprinter. Confidence is knowing you are strong on the flats, for instance, and the 98-pound climber who hopes to leave you behind in the hills will struggle in the flat crosswind if you go to the front of the pack and hammer. It’s knowing you thrive in the heat or suffer inordinately in the cold. It’s knowing that the course where you were behind the leader by 10 minutes last year won’t have you suffering nearly as much this year due to your improvement. Confidence is knowing that you mixed a weaker energy drink for this weekend’s race because last weekend the stronger concoction gave you a stomachache.